Several airline and trip planning sites will allow you to check "I am flexible with my dates" or a similar option. Is there any way to also search more broadly for location? For example, if you wanted to leave from YYZ or YKF and arrive at any airport in California, can a search for such flights be done somehow? I ask because when I plan plane trips, I want the lowest price. I'm OK with leaving a day or two later if I save $200 (same with the return trip). There are 3 airports within 80 km of me, I'll leave from the one with the cheapest flight. And I'm also OK with changing the trip to spend time exploring San Francisco instead of lying on the beach near San Diego, and that sort of thing. Normally this would take dozens of searches, but I'd like to see it all at once. http://uk.bestfares.amadeus.net/ - use the "Add nearby airports" checkbox and "Customs" menu. Yes, you can use http://matrix.itasoftware.com - just enter a destination, say LAX, click "Nearby" and pick airports (up to 300mi away I think). However, that's not super interesting as most of those airports are small regional/county airports that don't get mainline carrier service, so you can just enter destination airports (there aren't that many in CA). You can also do this with your departure airport, too. You can limit by carrier, # of segments, etc. I suggest using SkyScanner. On the home page, you will find a link titled 'Calendar' that gives prices between the destinations you want over the time range you choose, giving you a better picture than +/-x days that most other flight search websites have. To broaden area searches, choose a city name and opt for 'any' in the suggestions presented; e.g., in your case enter Toronto (Any). 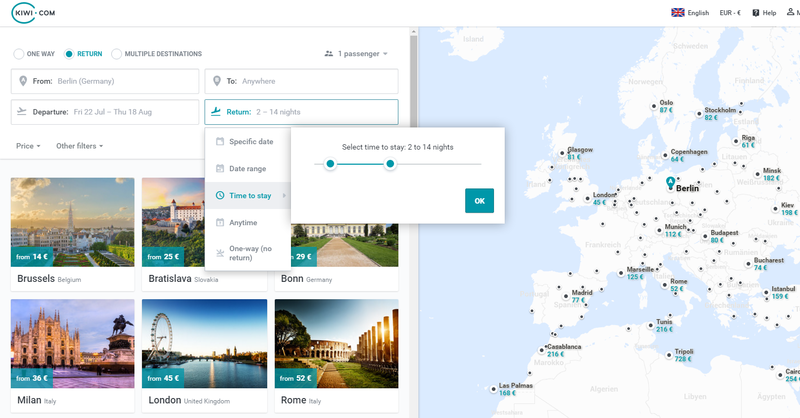 For booking flights from or within the US, Bing Travel has a 'price prediction' feature that that uses current and historical data to give suggestions on pricing trends. While this is not a 'broad' search per se, it does accomplish the same goal, i.e., help you find cheaper flights. 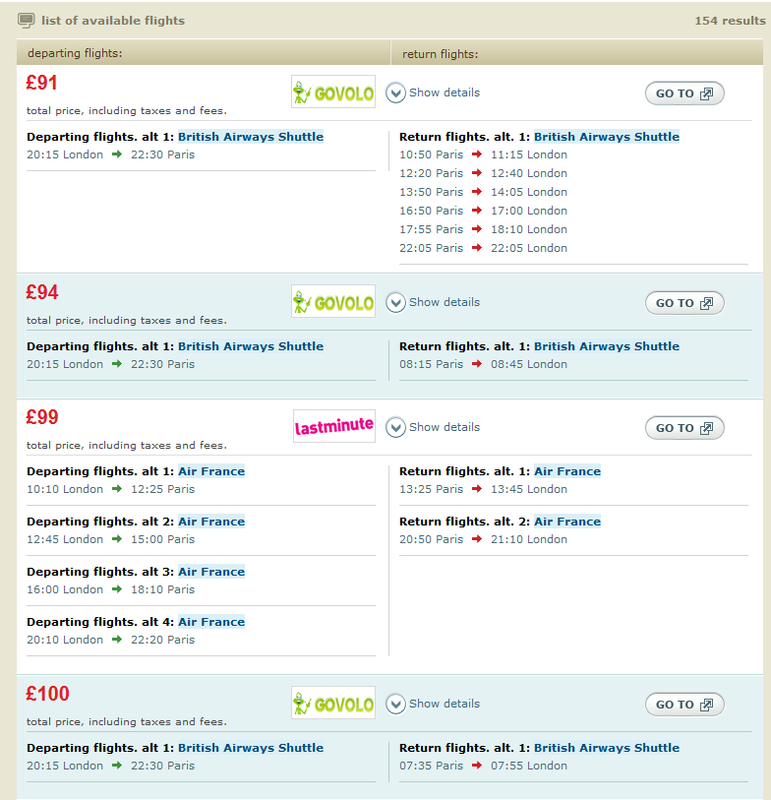 As of now SkyScanner offers ability to search for fares as broad as country -> destination. For example you can search for tickets from Germany to US based on your dates and other preferences. As of now one of the options on Skyscanner's destination is "Everywhere" so from a single source point, to basically anywhere in the world. http://matrix.itasoftware.com/ (answer) is the most powerful search tool I know of: multiple departure and destination airports (including nearby functionality), +/- 2 days or departure window with length of stay, multi-leg trips and fare class is shown. No low-cost airlines though and it only constructs itineraries, you need to buy your ticket (hopefully at the same price) at a (online) travel agency. http://www.azair.com/ (answer) has the most powerful search options I have ever seen: multiple departure/destination airports (but no multi-leg search), departure period, length of stay and preferred weekdays! 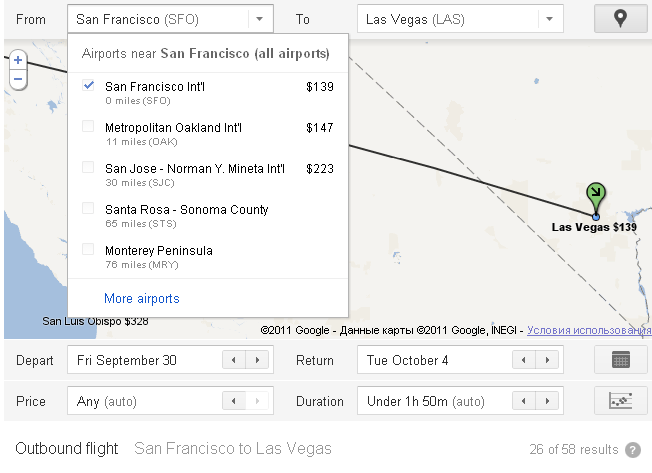 Adioso allows you to search for flights with natural language queries like "Australia to Europe in early June" . This is the only service that I know that can do this. Their prices are from a combination of their own data + Priceline + Cheapoair. Beyond the options already listed, azair has very powerful search options (see the advanced options), including choice of return and departure day, length of stay, period within which the trip should happen and a range of departure and arrival airports. 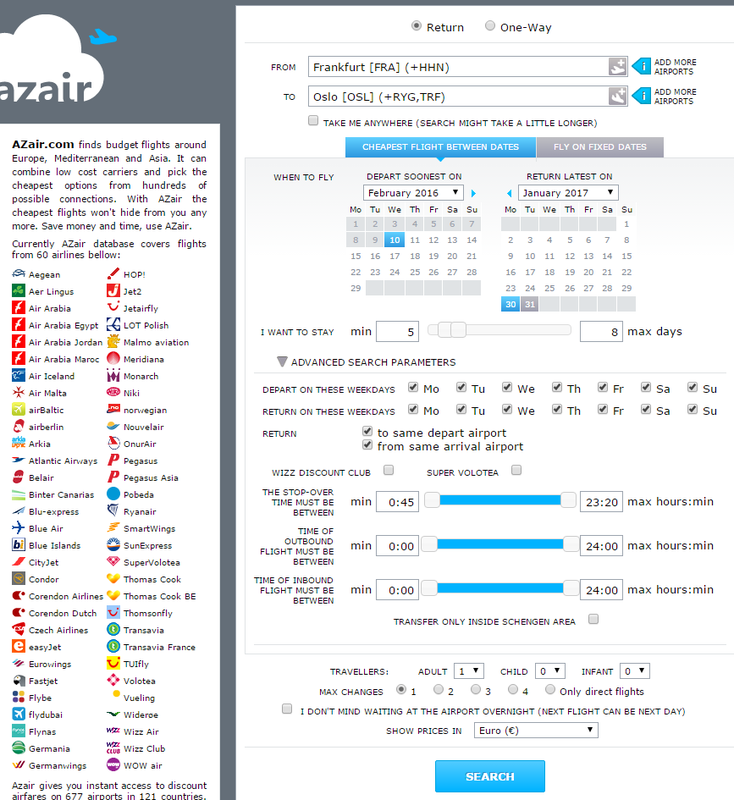 Select the "See calendar of lowest fares" option, and select the start of your range. You'll have to do a month at a time, but it's easy to change the date once you've look at each month. It's possible to specify options like which airline(s), how many stops, etc, but it's a little complex. If you click on the ? next to the "Enter Routing Codes" box you'll find the details on how to you need to specify what you're after. More often than not, prices are cheaper than what you'd be able to find using other search tools like the ITA matrix, or what the airlines offer for the same fare at their websites. The results are sorted by price, and you can see available flight times between destinations to adjust to your needs. As per EU consumer protection rules, the fare that you see is the fare that you pay (unless the airline charges extra for optional services like checked baggage, for example). You can be quickly redirected to the travel agency that sells the particular ticket, and for most sites, the travel reservation will be prepared for you with your search data, waiting for you to fill in the remaining details before payment. I travel mainly in Europe, and the results are consistently very good. I can't comment how well it works when both destinations are outside Europe, though. Sadly, currently it's not possible to search for +/- days within the specified date. Hipmunk now allows for multiple origin/destination searching for airports located in the same country and timezone. Simply input: SFO, LAX, SAN for San Francisco, Los Angeles, and San Diego. Another option with +/- 3 days is Cheap-O Air. I'm not sure if it uses one of the other engines underneath but the results seem to be a bit different from others I've tried and the prices are pretty good. Not the answer you're looking for? Browse other questions tagged air-travel online-resources planning flight-search-engines or ask your own question. How do I find cheap flights when I don't care about the date? Is there a way to find prices from departure city to multiple cities or countries at once?